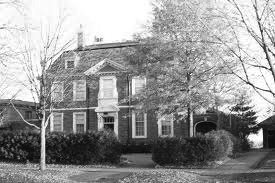 In 1925 Mrs. Theodore W. Griggs, née Livingston, inherited her family’s Summit Avenue mansion overlooking St. Paul, and embarked on a decade-long renovation program. 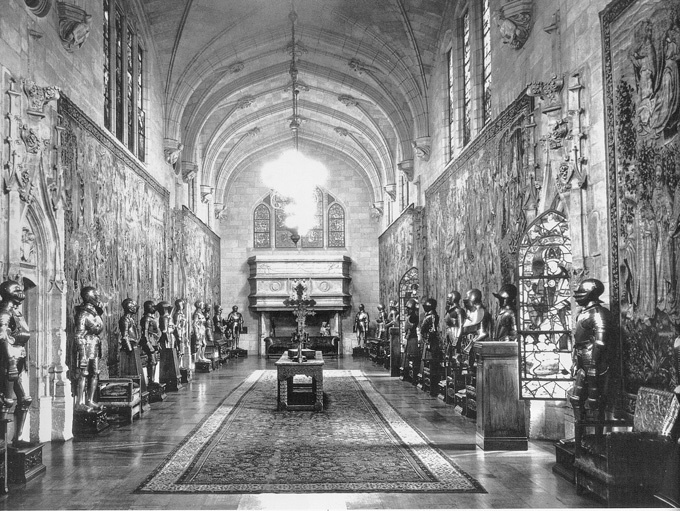 First, she persuaded Allen H. Stem, co-architect with Whitney Warren of New York’s Grand Central Terminal, no less, to take on the relatively small job of reconfiguring the interior, and installing an Elizabethan-style drawing room, while leaving the handsome but unfashionable Victorian facade relatively untouched. 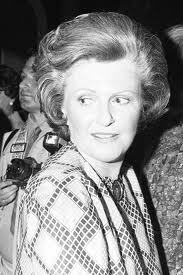 Then, she hired the high-society New York decorator Mrs. Philips Brooks Robinson, known professionally by her maiden name Miss Gheen. In landing the job she beat out Elsie de Wolfe, who, in her 1935 autobiography After All, trashed the decorator and her client, without naming names. In the span of a few years, Mrs. Griggs and Miss Gheen acquired ten period rooms, and a slew of 18th-century furniture from Jansen in Paris, Adolfo Loewy in Venice, and a still-smarting Elsie de Wolfe in New York. Installing period rooms is a complicated business, so Edwin Lundie, architect of choice to the local gentry, deserved a gold star in pulling it off. That, along with his charming manner and eye for detail, prompted Mrs. Griggs to commission him to create an “amusement room” in her capacious basement, where her daughter Mary could entertain friends and suitors on her coming out. After marrying, she went on, as Mary Burke, to assemble the most important collection of Japanese art outside Japan, inspired, she said, by her mother’s collecting. When Mrs. Burke died at ninety-six in 2012, her collection was divided between the Metropolitan Museum, and the Minneapolis Institute of Arts, where she had passed many a happy hour in her youth. Both museums would mount major exhibitions to commemorate those bequests in 2016. The amusement room was entered through an unprepossessing oak door in the foyer, which opened to an exquisite stairwell, hewn out of creamy marble, and swagged with a white silk-rope handrail. Guests descended to a silver-leafed room paved with mirrors, and grisaille reverse-painted-glass panels decorated with cavorting commedia dell’arte figures. Among the furnishings were silvered banquettes, a mirrored Serge Roche cocktail table, a Laurence Colwell glass sunburst clock, a pair of Steuben glass-and-chrome andirons, and an embarrassment of glittering Steuben glass ornaments. On December 23rd, 1935, Mary was launched in society at a debutante ball at the Minnesota Club in downtown St. Paul. On the 29th Mrs. Griggs launched the amusement room with a party for her daughter. On that frigid night guests sloughed off their furs, and entered this frosty jewel-box of a room — the Art Deco equivalent, you might say, of Doctor Zhivago’s icicled dacha. 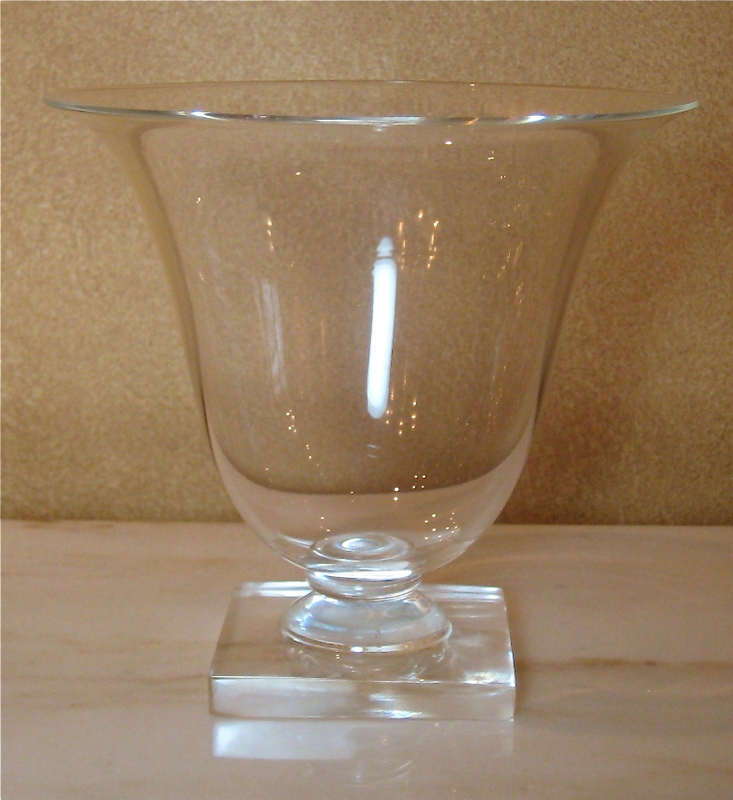 Steuben Glass was established in the town of that name, in New York State, by Frederick Carder in 1903. He remained as artistic director after Corning Glass, owned by the Houghton family, purchased Steuben in 1918. But by 1933, with the onslaught of the Great Depression, and decimated sales, their old-fashioned product line in yesterday’s colors was gathering dust on the shelves. And so the firm was turned over to the family’s young scion, Arthur Houghton, Jr., for a revamp that made design history. He brought in industrial designers and sculptors, like William Dorwin Teague and Sydney Waugh, who came up with streamlined designs executed in a newly invented, and startlingly translucent, uncolored glass. To showcase the line, a modern glass-block building went up on Fifth Avenue, where, in a bright, white, double-height showroom, a selection of stunning objects was purchased, commissioned, and shipped to Summit Avenue. And there they remained, with the 18th-century furnishings upstairs, until the 1980s when, after a brief stint as a house museum, the mansion was sold and the contents dispersed. He knew everyone who was anyone, but in his 1976 memoir, Fulco, Duke of Vedura, didn’t drop names. Nor did he mention his adventures in the Great War, or his brilliant career as a jewelry designer. 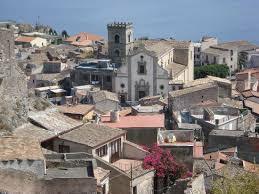 Instead he wrote of his idyllic Sicilian childhood. 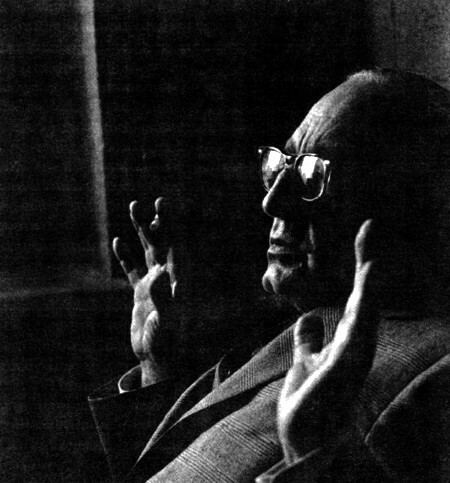 Verdura was then in his seventies, by which time he had retired from the jewelry trade that had brought him fame and fortune (which came in handy after having squandered his inheritance as a youth). But family and home had never been far from his mind, for he returned to Sicily often over the years, with his glamorous friends in tow. Our small painting is dated August 1972 on the back of the frame, and inscribed Forza d’Agro, the name of a seaside Sicilian town (where, a year or so later, Francis Ford Coppola filmed scenes for The Godfather). 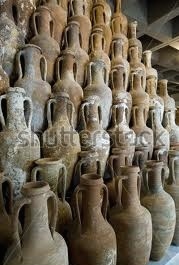 It shows an old paneled wood door hung with amphorae, the ceramic pots introduced to Sicily by the ancient Greeks. It’s impossible to say if the ones he painted are antique or modern, since their tried-and-true form didn’t change over millennia. In any case, Verdura must have come across this still life just waiting to be painted on an excursion to this town in that month and year. Around 1960, at the height of the Cold War, the high-society jeweler Fulco di Verdura painted this tongue-in-cheek miniature Allegory of War. In it he depicted Bellona, the Roman goddess of war, reclining on a military trophy of gilded armor bristling with spears and standards. 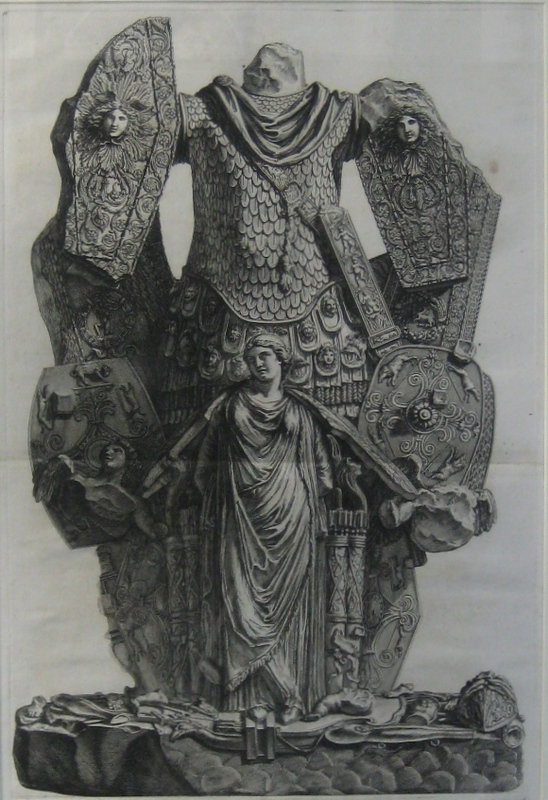 For centuries military trophies that commemorated battles won had been assembled from actual armor, and sculpted in stone like the ancient Roman marble etched in the 18th century by Giovanni-Battista Piranesi. Verdura, however, updated tradition by presenting Bellona (no less soigné than his client Babe Paley) reclining on a trophy, with nuclear mushroom clouds detonating on the horizon. 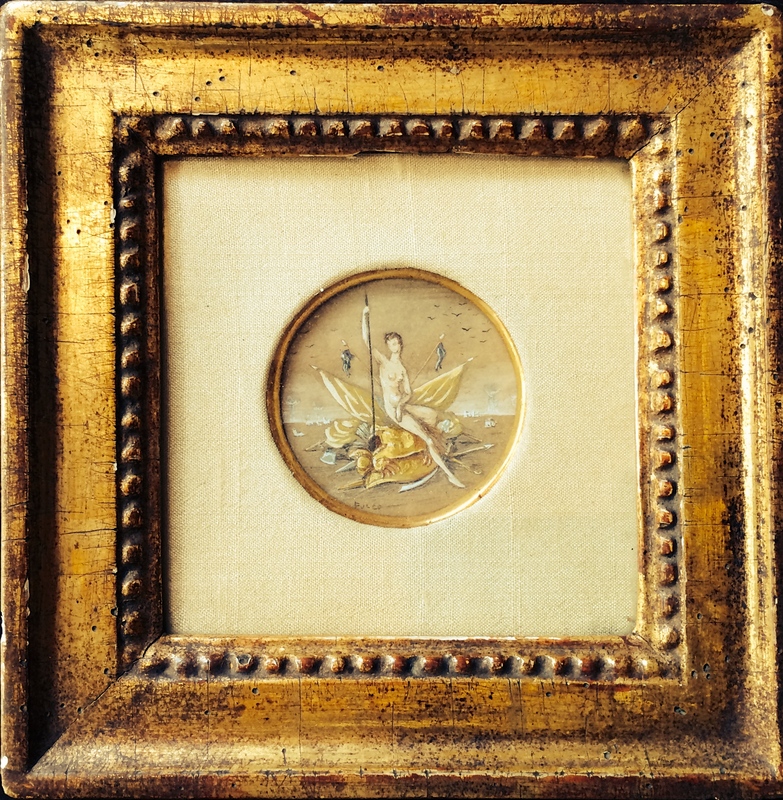 This painting retains its original silk mat and giltwood frame selected by the artist himself. It was made by, and bears the label of, Robert Kulicke, the premier framer in New York at the time, who happened to be a talented painter himself. 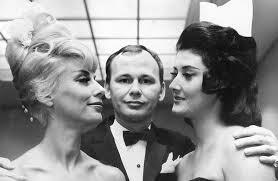 It comes from the collection of Kenneth Battelle, better known as Mr. Kenneth, hair stylist to the jet set. Verdura gave his paintings away as gifts, and sold others through tony galleries like Wildenstein and Knoedler. The pencil inscription “Mrs. Winston,” which appears on the back of the frame, suggests it belonged to Rosita Winston, the wife of real-estate tycoon Norman Winston, who was then cutting her bejeweled swath through international high society. When Gio Ponti sat down to draft a mirror with lighting fixtures for the rotunda of the 1928 Venice Biennale, he wasn’t yet the towering figure of 20th-century Italian architecture and design that he would become. The century was young then, and at thirty-seven so too was Ponti, who established his architecture practice the year before. That’s why he had only two buildings to his credit by the time the rotunda was unveiled — his own house in Milan, and a villa on the outskirts of Paris for the owner of Christofle, the silver manufacturer. Ponti, however, had been hard at work since the early 1920s designing household furnishings, like the now iconic light fixture that his French client had put into production in 1927. Ponti was on the fast track from the get go, and there he remained until drawing his last breath and floor plan at the age of eighty-eight. 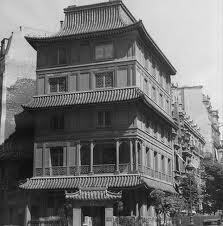 His red-letter dates began to accrue in 1923 when he became the art director for the Richard-Ginori porcelain company. 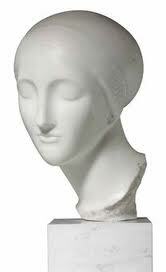 In 1925 he won the Grand Prix for those porcelains at the Exposition Internationale des Arts Decoratifs in Paris. 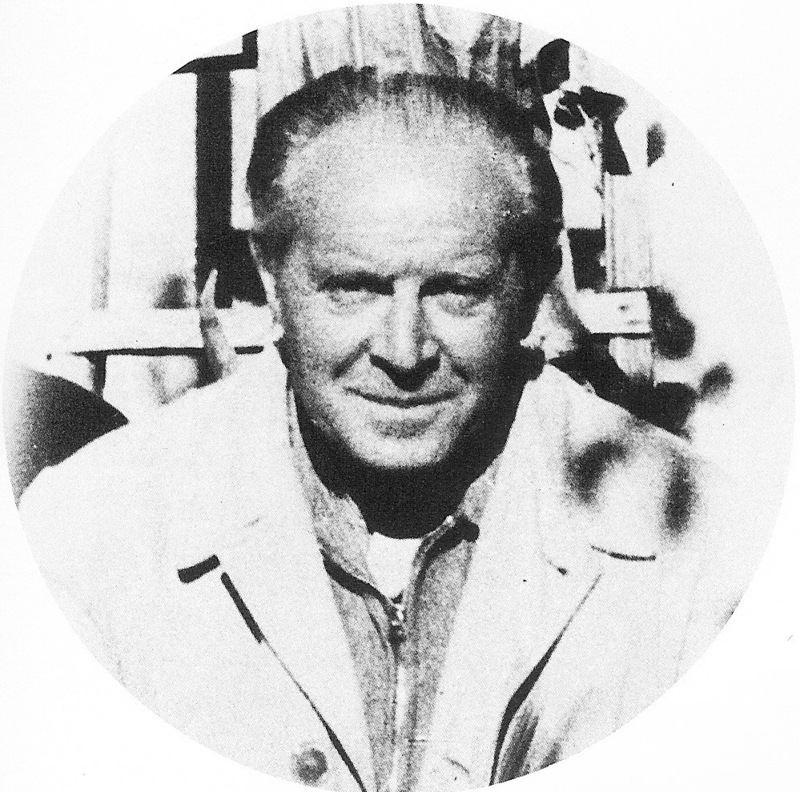 In 1927 he brought together a group of designers to form the association Il Labirinto (“because our ideas are labyrinthine”), dedicated to improving the quality of furnishings in the modern Italian home. That same year he launched the furniture line Domus Nova (New House in Latin) for La Rinascente, Milan’s largest department store. And in 1928 he published the first issue of Domus, Italy’s preeminent architecture and design magazine, which is still published today. 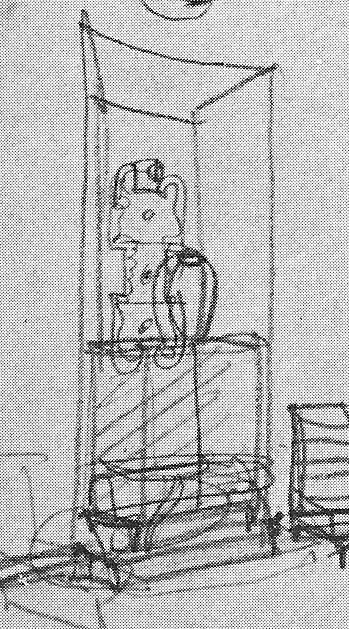 The 1920s also saw Ponti enter the field of exhibition design. 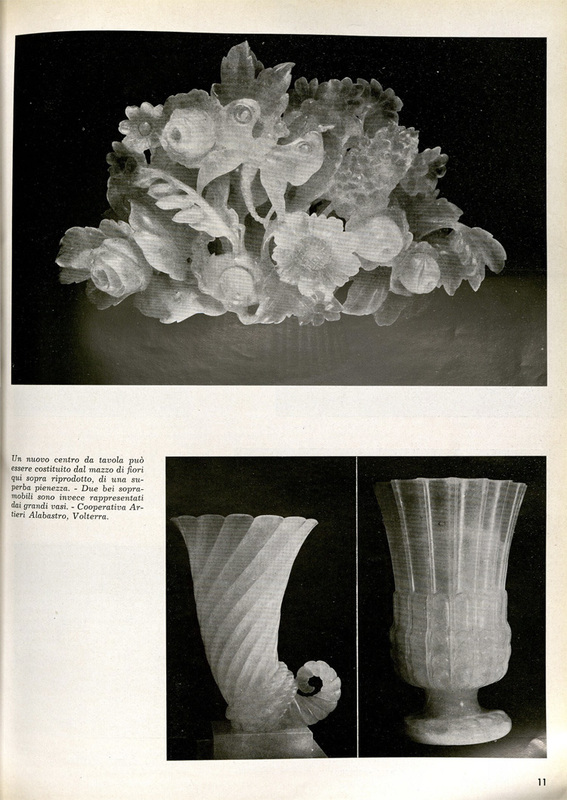 In 1925 he designed the Richard-Ginori stand where his award-winning porcelains were showcased at the Paris exposition. 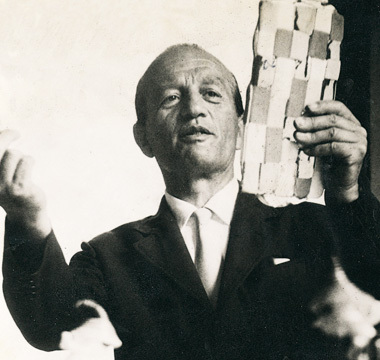 In 1927 he masterminded the setting of the Monza Triennale. 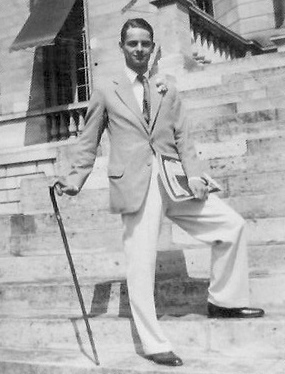 And in 1928, in addition to sending to New York a fully-furnished room for a modern design exhibition at Macy’s department store, he designed the Venice Biennale rotunda and its furnishings. Change is the name of the game at the Biennale, the celebrated contemporary art venue that made its debut in a purpose-built structure in 1895. 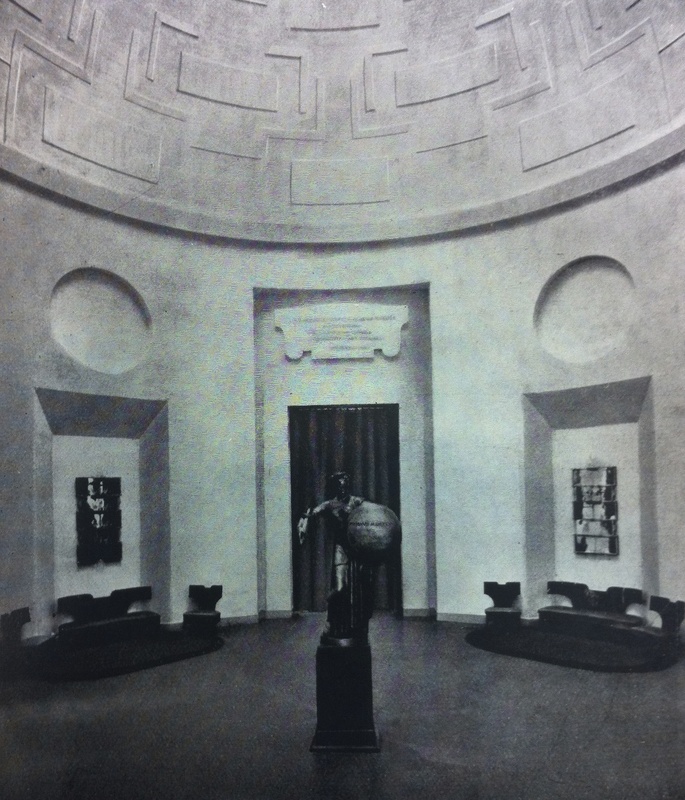 That’s why the rotunda was altered in 1907 and again in 1919 before Ponti rebuilt it in 1928. When he entered the picture it had an octagonal plan, a sectional dome, and was elaborately painted and gilded. When he finished it had a circular plan, a semi-spherical dome, and was painted flat white. This austere backdrop offset the dramatic silhouettes of his chairs and sofas, which were made in the workshop of Melchiorre Bega, and his four ravishing mirrors with lighting fixtures, which were made by the now legendary Venini glassworks. We’re proud to have rediscovered one of these mirrors — the only one known to survive. 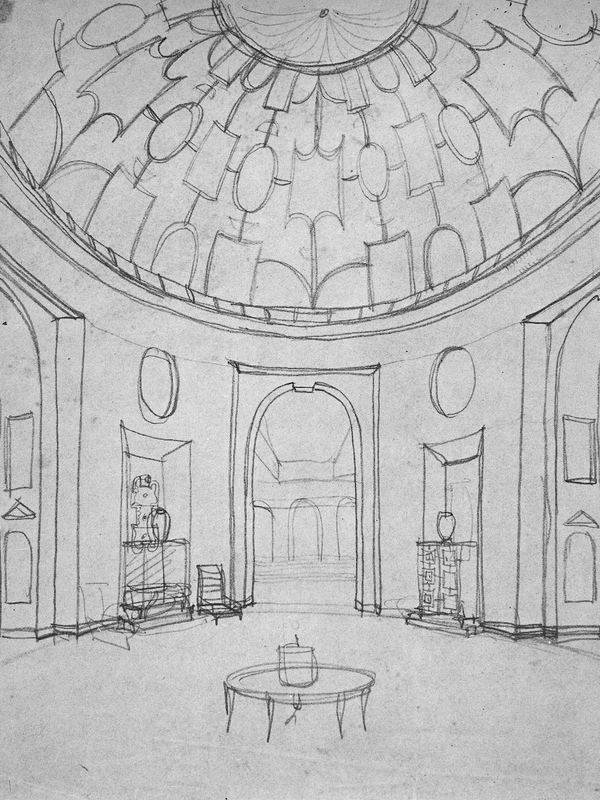 Ponti’s preliminary sketch for the rotunda shows the architecture largely as executed, and a furnishing scheme that wasn’t realized. 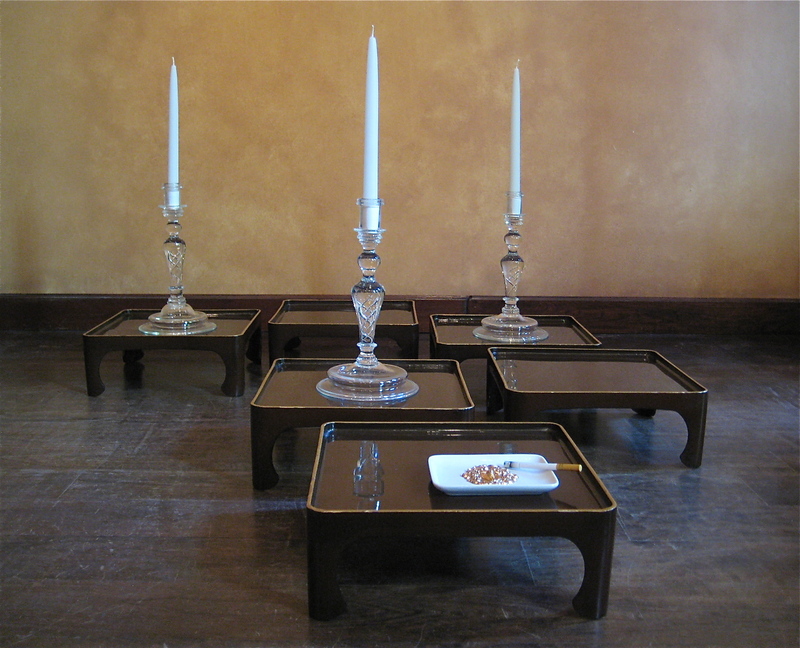 He would come to change the seating arrangement, and eliminate the center table, cabinets, and vases. As for the mirrors, he roughed in an idea for one with three light bulbs to the left of the portal. 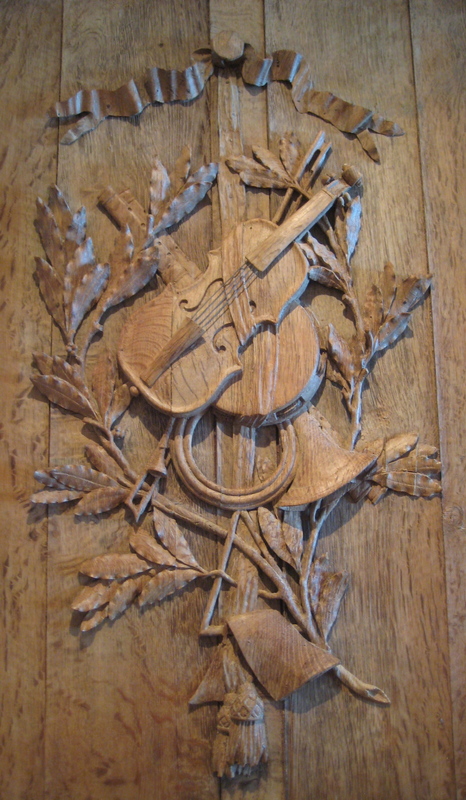 But since it overlaps with the cabinet, one or the other would have to go. In the end, the mirror won out, grew from three to eight plates, acquired bowls to hide the bulbs, and multiplied into a set of four. They were made by Venini on the island of Murano, just a few vaporetto stops from the Giardini, the public gardens where the Biennale was and is still held. The Venini family had been in the glassmaking trade since the 18th century, but in 1921 their twenty-six-year-old descendant Paolo relocated the firm from Como to Venice, at Ponti’s suggestion it has been said. Then, Venice was teeming with rich tourists and talented glassblowers, and the financial boom that would make the 1920s roar was just beginning to gather steam. Venini’s success, however, can’t be chalked up merely to his being in the right place at the right time. He was, after all, a shrewd businessman and a champion of modern design. 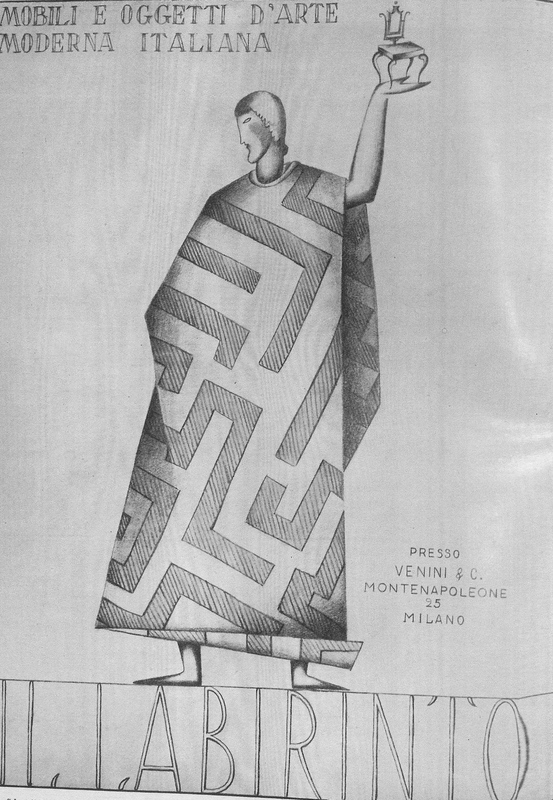 One of the seven members of Ponti’s Il Labirinto group, Venini mounted exhibitions of their work in his Milan showroom, for which Ponti drew an ad that he published in his magazine Domus. For his part, Venini saw to it that his glass featured prominently in every Biennale since he moved his glassworks to Venice. 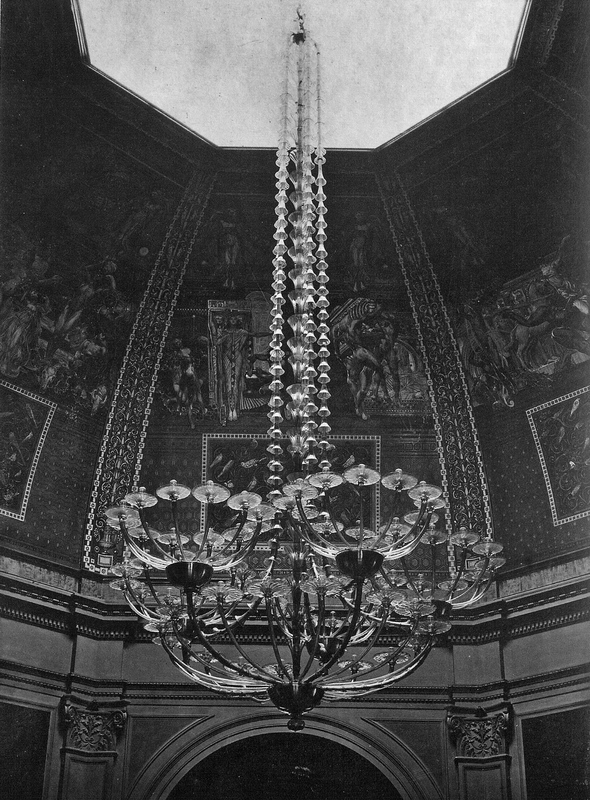 In 1926, for example, he supplied the rotunda with a showstopper of a chandelier. And so, when the next Biennale was being planned, Venini no doubt wielded his considerable influence to land Ponti the rotunda commission, and then on Ponti to design something spectacular for it that Venini’s firm would make. Under the art direction of the sculptor Napoleone Martinuzzi, the Venini glassworks was running at full tilt in 1928. 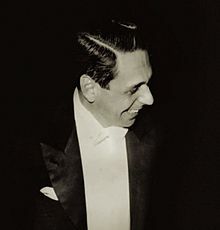 That year, in addition to developing the product line, he designed and oversaw the fabrication of an over-life-size sculpture of Josephine Baker, the African-American dancer and chanteuse who was then all the rage in Europe. It stole the show at the large Murano glass exhibition, which was held in the exclusive Excelsior Hotel on the Lido during the run of the Biennale. 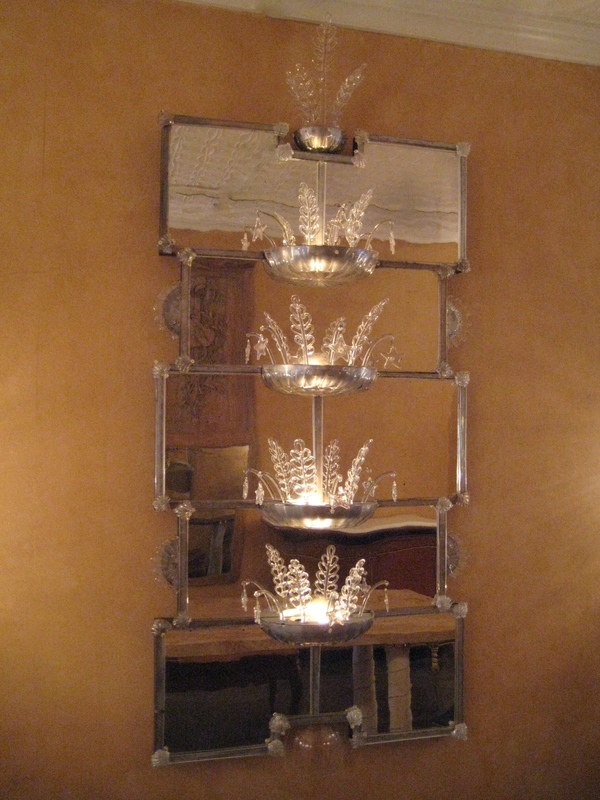 But Venini’s most ambitious project that year was the fabrication of the four Biennale mirrors. To our knowledge they were the first mirrors Venini made, the largest ones they’d ever make, and the first of their many collaborations with Ponti. The Biennale mirrors weren’t designed to be functional mirrors or lighting fixtures, since the embellishments interrupt reflection, and the sconces emit little light. Rather, they were presented as works of art in their own right, and their purpose was to demonstrate Venini’s mastery to the crowds that gathered beneath their glimmer. During the run of the Biennale, the mirrors may have been sold or placed in Venini’s storage, which was destroyed in a 1973 fire, or sent on the road like the Josephine Baker, which was shown in Paris and London before it vanished without a trace. In any case, the mirrors were also considered lost until this one resurfaced in a New York auction, unidentified and without a provenance. The fabled city of Venice, where the mirrors were made and exhibited, inspired Ponti’s design. 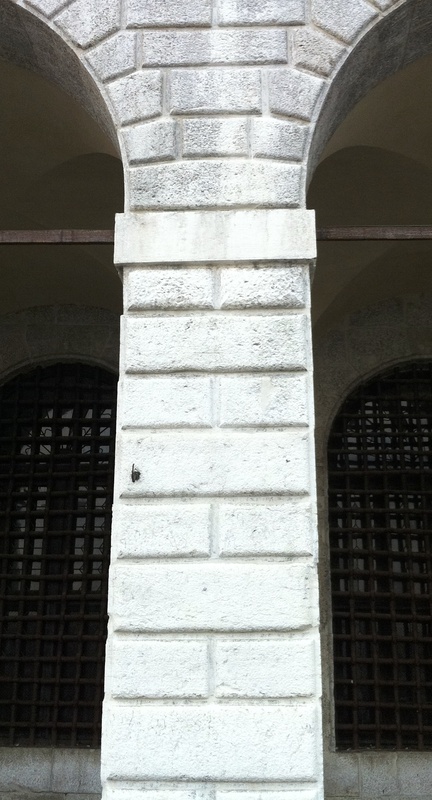 The arrangement of interlocking mirror-plates replicate the pattern of traditional masonry construction, as seen in the 16th-century arcade by Jacopo Sansovino on the Grand Canal. The undulating hand-made mirror plates reflect light and image like the lagoon’s rippling surface. A rainbow iridescence was applied to select elements (and achieved by an ancient tin-fuming process rediscovered by Martinuzzi) mimics the phenomenon of marine phosphorescence. 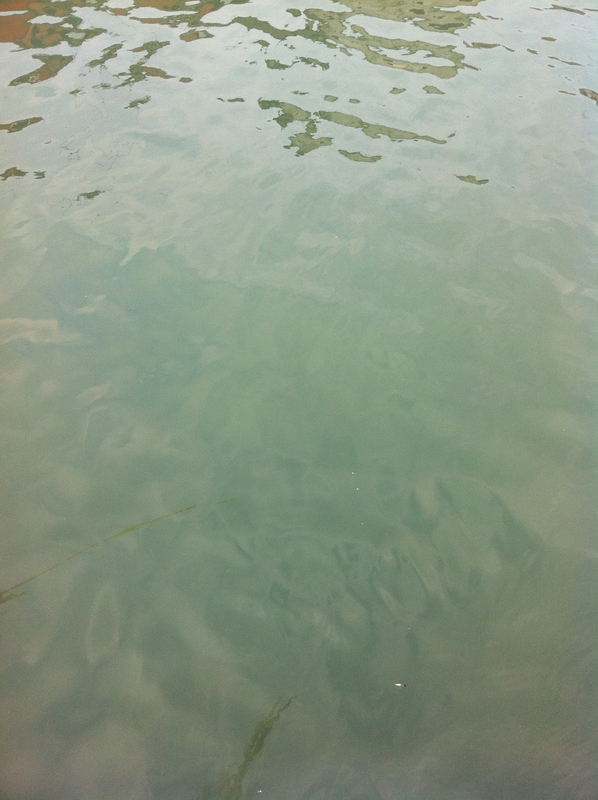 Four half-disks on the outer edges could pass for splashes of water. The joints of the bars that define each mirror plate are masked with seashells. And the seaweed fronds and starfish, which spring from the bowls, are found in the sea from which Venice derived her wealth and power. Transparency, reflection, evanescence – characteristics of glass, mirror, and water – are recurring themes in Ponti’s work. 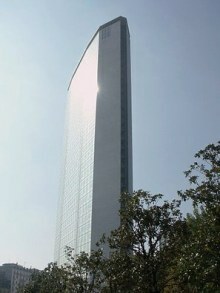 Some thirty years after the Biennale mirrors were made, Ponti would design the Pirelli Tower in Milan, a graceful thirty-two-story fin of glass that’s considered his architectural masterpiece. Germano Celant, a curator at the Guggenheim Museum in New York who organized the 2004 Venice Biennale, described the skyscraper in his foreword to Lisa Licitra Ponti’s book on her father’s work as “aqueous…a vertical jet of solid lightness that can be identified with water itself.” We might well describe our mirror with those very words. In 1921, a recent law-school graduate from Milan named Paolo Venini arrived in Venice to take possession of the glassworks he purchased on the island of Murano. Venini (below right) was the scion of a family that had been in the glassmaking trade since the late 18th century. Back then, they were in Como, and there they would have remained in obscurity had it not been for their descendant who saw the potential in relocating to Venice, where talented glassblowers abounded and the free-spending beau monde forgathered. Fabled since the Middle Ages, the prestige of Venetian glass had diminished by the time Venini entered the picture. Then, the charming but retardataire production of Venice had long since been overshadowed by the innovative work of Tiffany in America, Loetz in Austria, and Lalique in France, among others. But by Venini’s death in 1959, Murano had undergone a renaissance, thanks to this newcomer who raised the creative bar, in the process of achieving international preeminence for his own firm. Venini’s savvy selection of artists and architects as in-house designers was essential to his success. Among their number was Napoleone Martinuzzi, the sculptor who designed the prototypes for our chandelier and sconces around 1930. 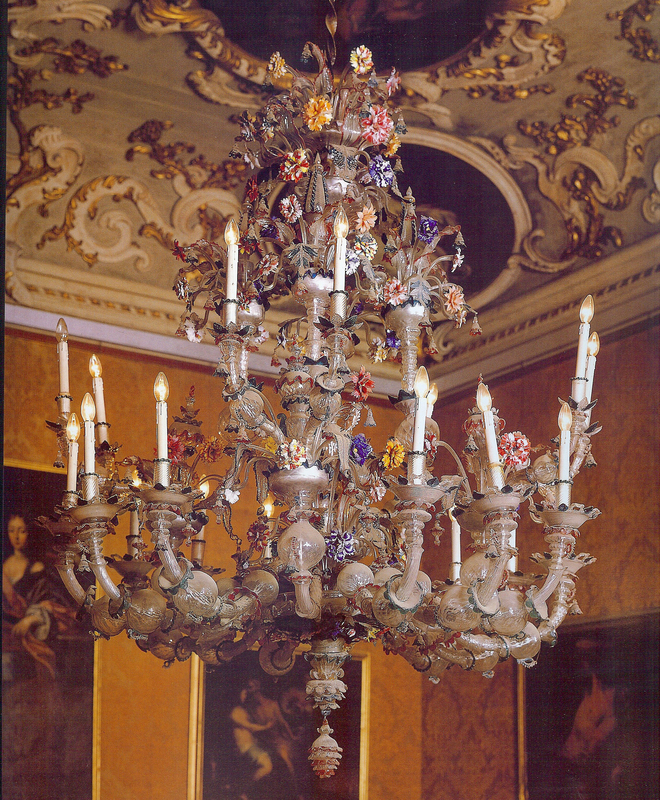 Martinuzzi had been inspired by 18th-century examples, like the chandelier in the Palazzo Rezzonico, which had been made by stringing glass elements on metal armatures. Martinuzzi, however, blew the dust off tradition by simplifying form, stripping excess embellishments, eliminating color contrasts, and utilizing aluminum rather than brass fittings. The effect, stylistically speaking, is more café society elegance than ancien régime nostalgia. 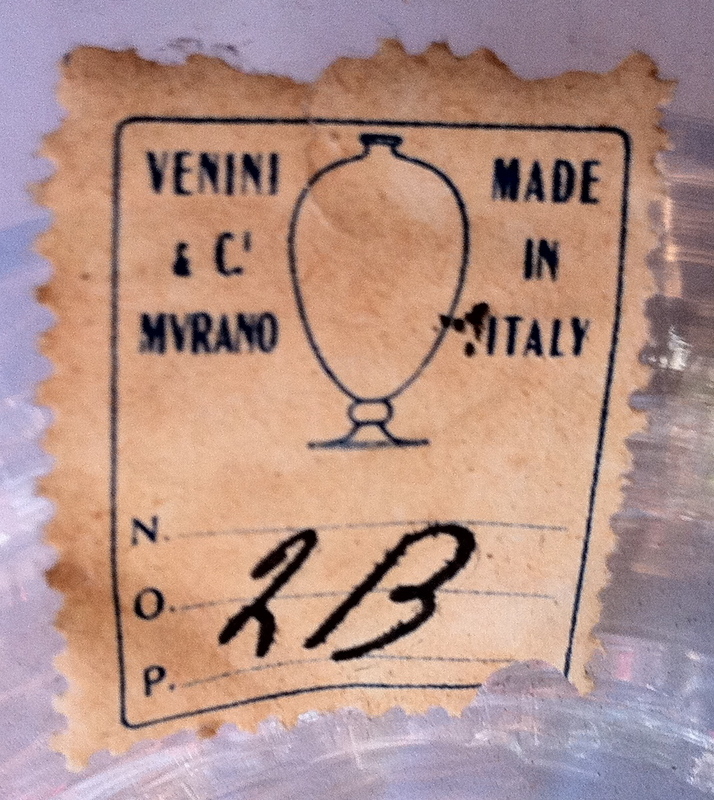 In the early 1950s, our chandelier and sconces were shipped from Venice to Boston, along with a few spare parts, including one that still bears a Venini label. They were a gift from Paolo Venini to his old friend Giorgio de Santillana (above right), an Italian philosopher who landed a professorship at MIT, and his wife Dorothy, a book editor who steered Julia Child through writing the magisterial cookbook Mastering the Art of French Cooking (as seen in Nora Ephron’s recent film Julie & Julia). Both Giorgio and Dorothy had sons by previous marriages, and both, as fate would have it, came to marry Venini’s two daughters. Giorgio’s son, Ludovico, married Anna Venini, and Dorothy’s son, Stanley, married Laura Venini (below right). Anna, who remained in Venice, became the unofficial Venini historian, and her husband Ludovico would take over the Venini glassworks when his father-in-law died in 1959. 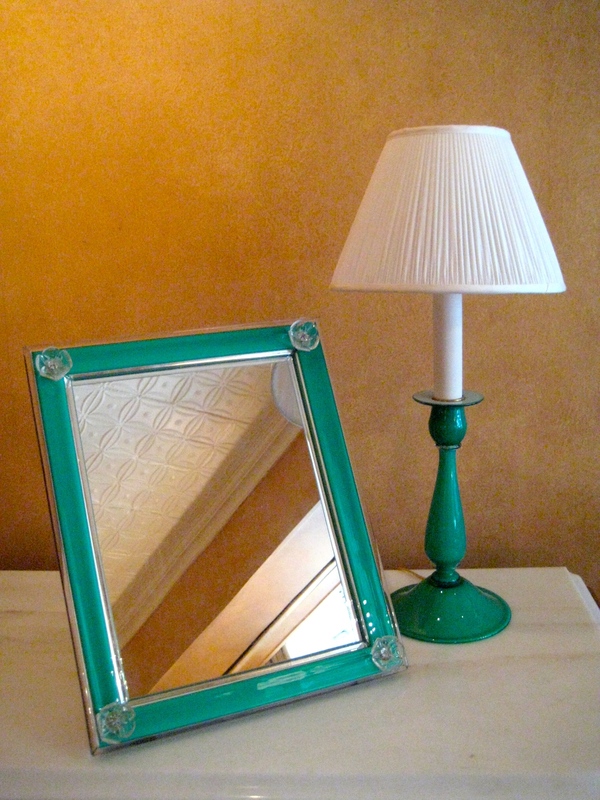 Laura, who owned our Venini dressing-table mirror and matching lamp (below), was no slouch herself. 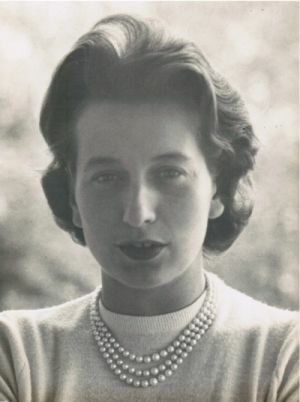 She studied languages at both Oxford and the Sorbonne, and served as her father’s translator in 1952 when on a business trip to the United States, where he met with department store buyers and museum curators. And that is how she came to meet her future husband, Stanley Hancock Hillyer, an American businessman and a descendant of John Hancock, signer of the Declaration of Independence. Two years later, Laura and Stanley married in Venice, and settled in Milan where they furnished their home with an embarrassment of Veninis. In 1958 they packed up these modern treasures, as well as a few from previous centuries, and moved to Boston. Widowed relatively young, Laura pulled up stakes yet again and settle in Manhattan, where she became the vice president of Vignelli Associates, the celebrated design firm established by Massimo and Lella Vignelli, who had designed glass lighting fixtures for her father some years earlier. And so, over the years, and on two continents, this lovely dressing-table mirror captured Laura’s elegant visage, lit by a matching lamp, as she applied her maquillage for many a hard day at the office, and more than a few glamorous nights on the town. You can be forgiven for thinking the old saw “see Naples and die” warns the tourist against visiting a place that’s reputedly run by the Mafia. But when Goethe penned these words in his travel diary in 1787, what he meant was that one could go to the grave satisfied after experiencing the pleasures — both aesthetic and illicit — that this city offered in abundance. Had that not been the case, English lords wouldn’t have considered Naples to be the highlight of the Grand Tour. Those milordi, as the Italians called them, returned home with crates of paintings, statuary, and even the occasional artist in tow. 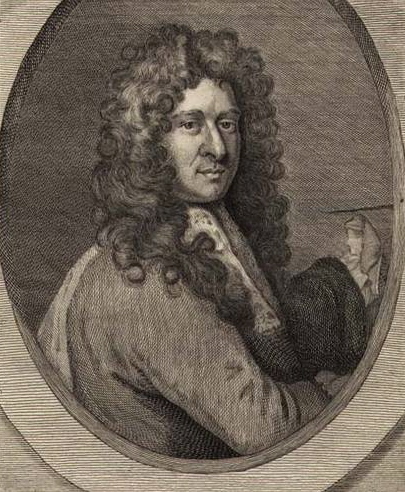 Among them was the Neapolitan painter Antonio Verrio, seen below brush in hand, who arrived in the Duke of Montagu’s entourage. Verrio’s mastery of illusionistic painting, then a novelty in England if a commonplace in Italy, lofted him to the pinnacle of success and the patronage of kings. 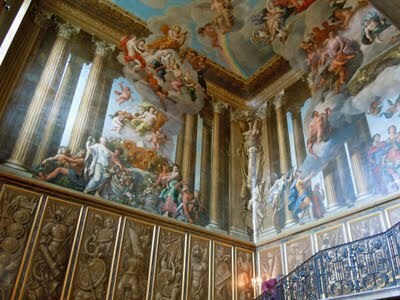 For King William III, Verrio frescoed the grand staircase at Hampton Court Palace with a swirl of gods descending from Mount Olympus. Below this scenographic tour de force are illusionistically painted military trophies that bear comparison with our tondi, as art historians (following the Italian) call round paintings. Both depict sculpted stone casting shadows on colored backgrounds, and both were painted with the slapdash vivacity characteristic of Italian artists. 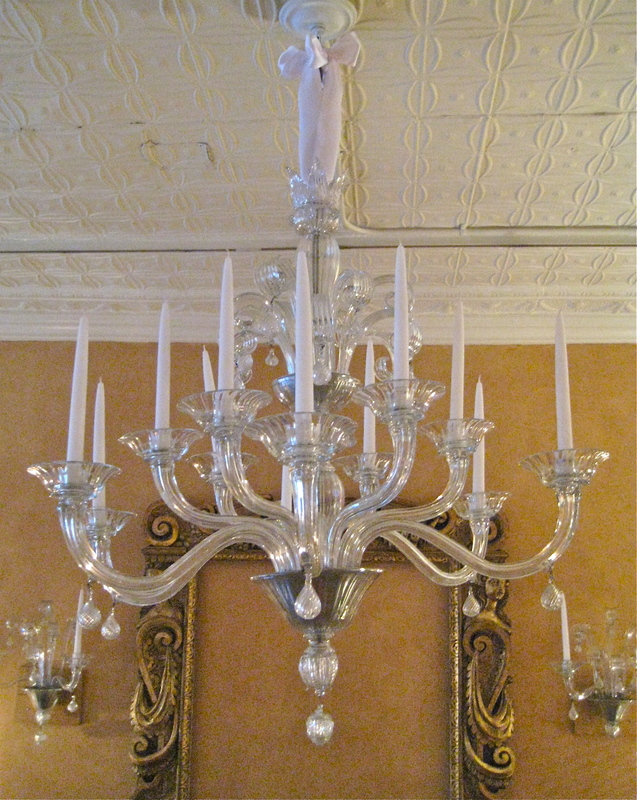 Our tondi represent Jupiter in all his bearded majesty, and Diana, the moon goddess with a lunar crescent in her hair. 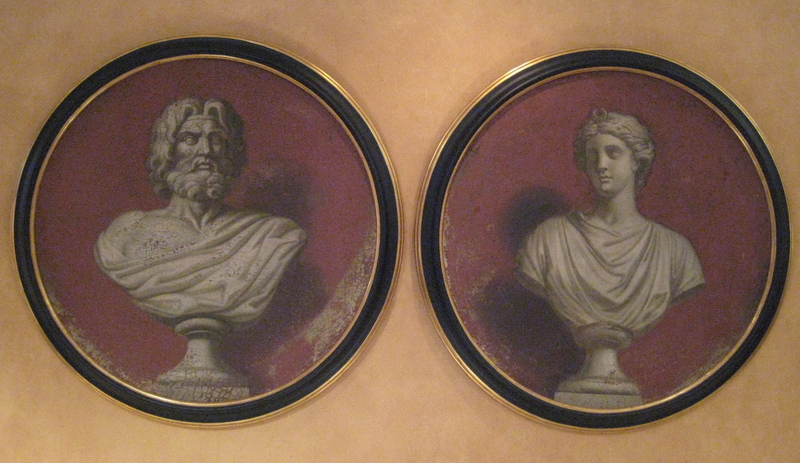 Painted di sotto in sù (“as seen from below”), they would originally have been positioned high in a room, like the pair of busts in niches at Bellamont Forest, an 18th-century Irish country house. No one had a keener appreciation for the Anglo-Saxon country house than the great Italian decorator Renzo Mongiardino, who did up more than few of them himself in the 1970s and 80s. Overseeing his jobs in England and America (and doing some on his own, too) was Gaser Tabakoglu, a Turkish-born cosmopolite who had purchased our handsome tondi from Carlton Hobbs, the eminent English dealer. This is where I entered the picture, laying eyes on them for the first time over a glass of scotch in Gaser’s lacquered sitting room on Sloane Street in London. The next sighting came a few years later when spending a weekend at Brick House, Gasser’s 19th-century retreat in upstate New York, where they hung on the candy-striped-fabric walls of the master bedroom. Back then I was a contemporary art dealer, but in 1994 I switched to dealing in antiques from a townhouse apartment. The first person to sound the buzzer and mount the stairs was none other than Mark Hampton, America’s preeminent decorator (now there was a class act). 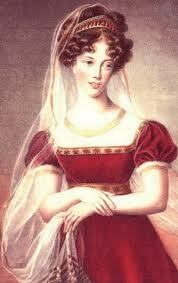 He, in turn, sent over Mrs. Carter Burden who leveled her discerning gaze on the tondi I had since acquired from Gaser. She and her husband (now there was a collector) found them irresistible, so off they went to be mounted above the doors of their Fifth Avenue, double-height drawing room (now that is what I call decorating). A room and a collection that would have done any of those 18th-century English milordi proud. 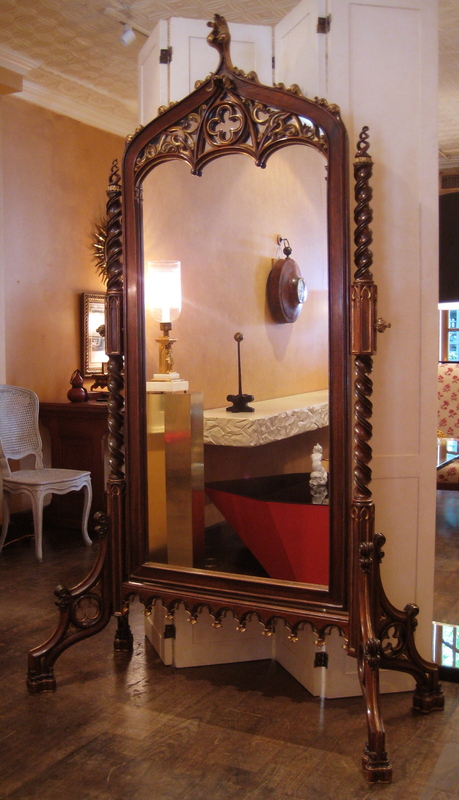 A Continental 19th-century cheval mirror of mahogany, gilt gesso, and gilt-metal hardware. 85 ½” high, 50” wide, 22” deep. Sold. History, however, contradicts his boast, for in the mid 18th century, long before Chateaubriand entered the picture, a small but influential group of tastemakers in England and France had already discovered the charms of the Gothic. 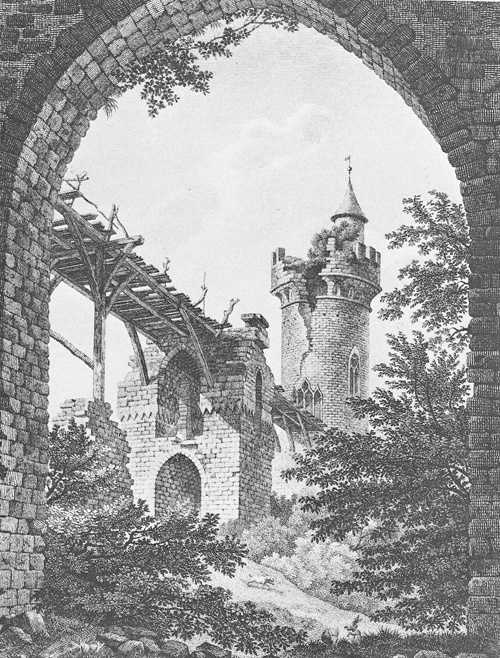 In the 1750s the writer Sir Horace Walpole built a “gothick” castle named Strawberry Hill, and in the 1780s the painter Hubert Robert designed a picturesque Gothic ruin for the Princess of Monaco’s garden. And by then, in the furniture trade, Chippendale’s Neo-Gothic designs were all the rage in London, just as Jacob’s chair backs with pointy arches were amusing jaded Parisians. 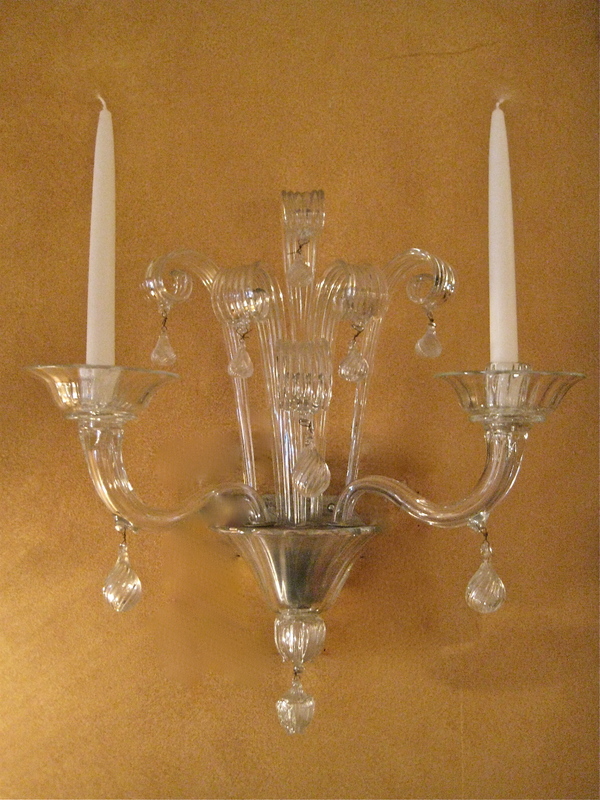 The aristocratic delicacy of Rococo and Neo-Classical design didn’t expire with ancien régime France, or Georgian England. 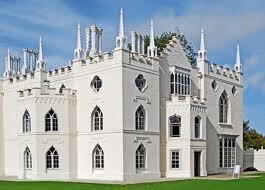 Rather, it flourished well into the 19th century and left its mark on the early Gothic revival. 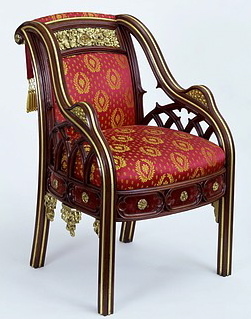 This can be be seen in the 1823 armchair by Auguste-Charles Pugin, a refugee who escaped the the turmoil of Revolutionary France to settle in London. By the middle of the 19th century, when his son A.W.N. 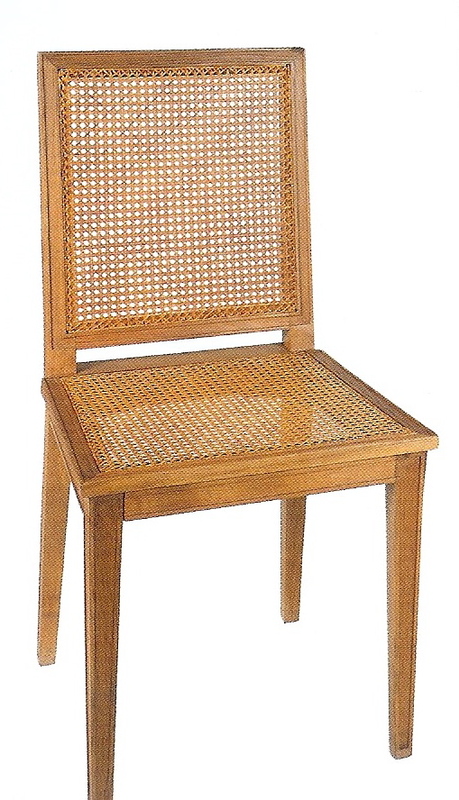 Pugin, architect of the Houses of Parliament, designed this 1864 side chair, the style had come to assume a sober mien that was in keeping with the zeitgeist of the Industrial Revolution. 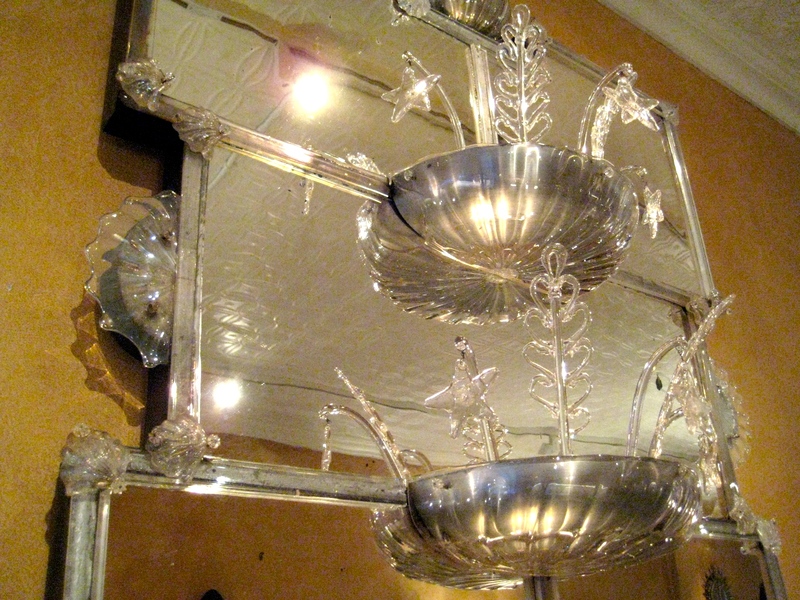 The graceful elegance of our cheval mirror inclines us to date it to the 1840s. As difficult as it is to say exactly when it was made, pinpointing the where isn’t much easier. That’s because the Neo-Gothic style spread from Moscow to New York by the 1850s, and reached every continent but Antarctica by 1900. So while the mirror’s defining characteristics – the openwork double-helix finials, the ribbed-serpentine columns, the florid central crocket – are nothing if not distinctive, they don’t suggest a place of manufacture, which is why our research continues. 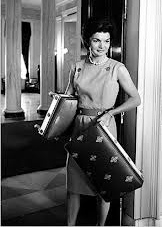 “I can never ever thank you enough for twisting Boudin’s arm and making that enchanting, brilliant man come to Washington,” wrote a grateful Jackie Kennedy to Jayne Wrightsman, the wife of an oil tycoon and an eminent collector of 18th-century French furniture. Stéphane Boudin, the director of Jansen, the great Paris decorating firm, had just given the young senator’s wife some free decorating advice. The big payoff for him would come a few years later when Mrs. Kennedy, now the First Lady, asked Boudin to redecorate the White House. Landing this prestigious job would have pleased Boudin, whose client list included not only Jayne and Charles Wrightsman, but Babe and Bill Paley, Marella and Gianni Agnelli, and scores of other luminaries as well. 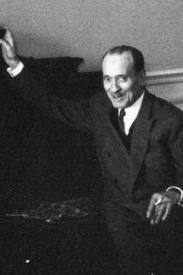 But it wouldn’t have fazed him either, having decorated for royals (Leopold III of Belgium), royals in exile (the Duke of Windsor), and self-proclaimed royals (the Shah of Iran). Still, for a man in his seventies who was on the verge of retirement, it was a suitable grand finale. 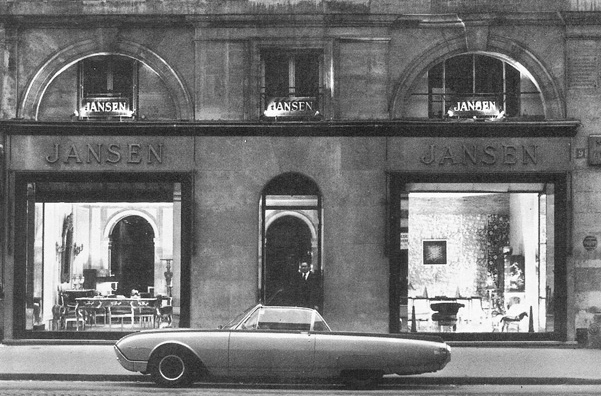 Some years earlier, Jansen had opened a boutique at 9 rue Royale on the ground floor of their Paris headquarters. There, the firm’s clients and well-heeled passersby could breeze in and buy a vintage bergère, a modern dining table, a charming picture, or a precious bibelot. With the success of this boutique, and rave reviews coming in for the White House decor, the time had come to open a Jansen boutique stateside. 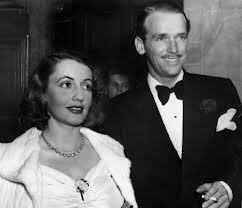 Enter Pamela Hayward, an English thoroughbred who was then married to Leland Hayward, the producer of countless hits on Broadway, including South Pacific, Gypsy, and The Sound of Music. 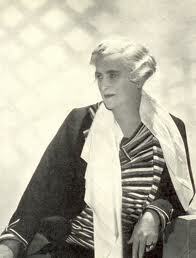 Mrs. Hayward was a daughter of Lord Digby, an ex-wife of Winston Churchill’s son Randolph, and a future wife of Averell Harriman, the American railroad heir who was also an ambassador to the Court of St. James’s (she would herself be appointed ambassador to France some years later by President Clinton). If a stint as a New York shopkeeper in the midst of all this sounds like a comedown, keep in mind that the Jansen boutique in Paris was run by the beautiful Neapolitan princess Cora Caetani. Enough said? And so it came to pass in 1963 that Mrs. Hayward opened, managed, and stocked the inventory of a Jansen boutique at 32 East 57th Street. 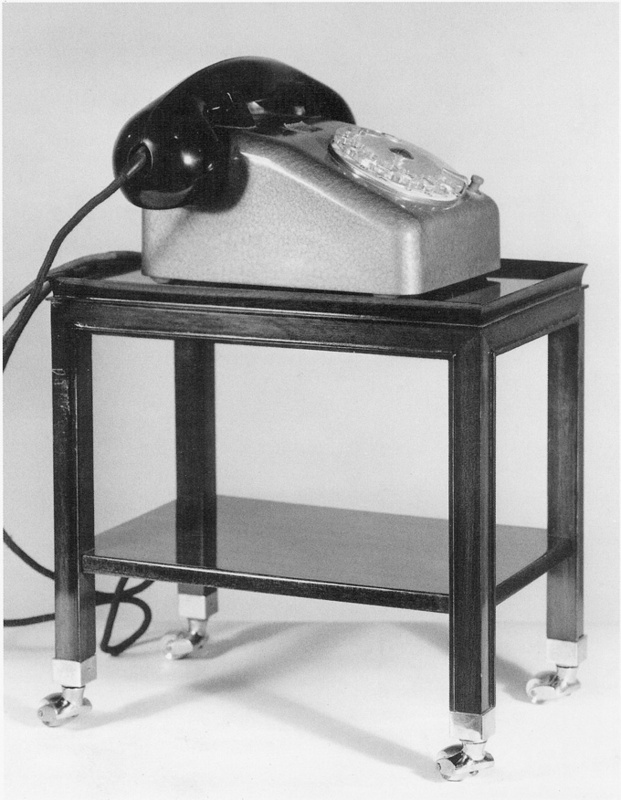 There she received her high-society friends, including Brooke Astor, who was so taken with these charming telephone tables (which had been designed in the firm’s Paris studio) that she bought several. And no wonder, since their brass wheels spared the busy socialite from having to lug hither and yon the large, wired telephones of that day. And in our own day of small, cordless ones, the tabletops can comfortably accommodate the modern socialite’s Blackberry, not to mention her ashtray and glass of Chardonnay. A Louis XVI trumeau mirror with a trophy of musical instruments, circa 1780. Oak and mirror plate. 81″ high, 36“ wide. $20,000. “Don’t forget, there were people with good taste in the 18th century as well” said Eugenia Errázuriz to Jean-Michel Frank, sometime around 1930 in Paris. Coming from an avant-garde tastemaker like her, that admonition might have surprised the designer of modern furniture and interiors who was then just coming into his own. After all, she was an intimate of Pablo Picasso, a patron of Igor Stravinsky, a backer of Serge Diaghilev’s Ballet Russe, and, on the cusp of seventy, a client of Coco Chanel’s still. Fashionable Parisians were abuzz over the minimally-furnished home of Errázuriz where, following her dictum “elegance is elimination,” she hung just one of her many Picassos on the chalk-white walls of the salon [see VINTAGE PHOTOGRAPHS]. But if they looked closely, as Frank undoubtedly did, they would have seen some of her fine Louis XVI pieces among the modern upholstered furniture and Giacometti lamps Frank supplied (see below left). With her words ringing in his ears, and her 18th-century furniture before his very eyes, Frank set about designing the Louis XVI-style pieces that would round out his own furniture line. His versions, however, were no mere copies, for he made the tried and true look decidedly new by eliminating superfluous ornament, emphasizing line and proportion, and substituting humble oak for fancy giltwood and mahogany veneer. Meanwhile, across the English Channel, the decorator Syrie Maugham achieved a similar look by trawling the countryside for antiques on the cheap that she’d strip of original paint and gold leaf. A sacrilege to be sure, but the abstract, modern-looking results would became so fashionable that soon the only antiques not in danger of being stripped were those safely lodged in museum collections. Fast forward to the present, and our acquisition of this handsome Louis XVI trumeau mirror that had been stripped to the oak decades ago. 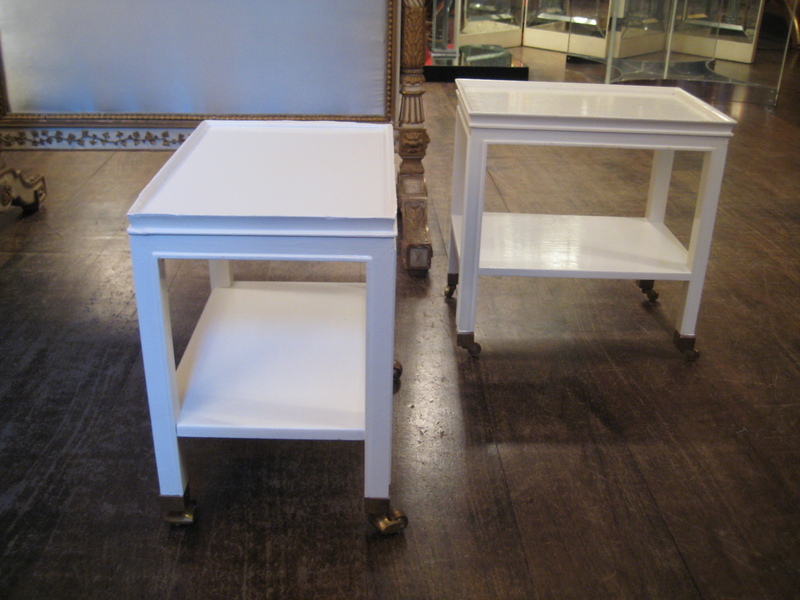 We decided not to repaint and regild it since that would erase a chapter of its history, as well as the history of taste. Besides, as Errázuriz and Frank knew, line and proportion trump surface decoration. Those qualities, and the trophy of musical instruments – flute, horn, tambourine, triangle, and violin — are what make our mirror sing. When carved in the 18th-century, this trophy would have been recognized as an allegory of music, just as the branch of laurel would have been associated with Apollo, the god of music who wore a wreath of it in his hair. The charm of trophies representing the arts, the seasons, and the sciences, have lost none of their appeal since the reign of Louis XVI. 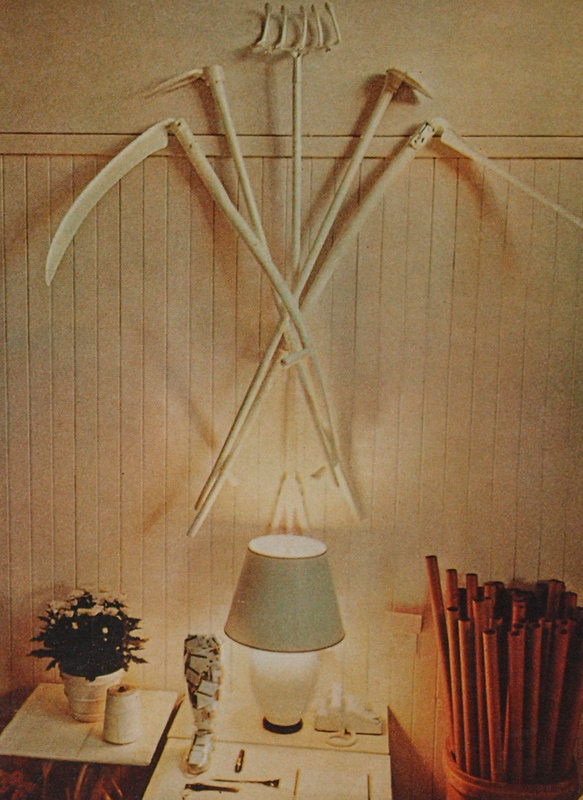 In the 1970s San Francisco designer John Dickinson [see CASE FURNITURE and LAMPS] created his own trophy of agriculture from a group of actual farm implements painted white, and arranged on a wall in his own home. Thus did Dickinson, like Frank and Maugham half a century earlier, make the 18th-century look new yet again. 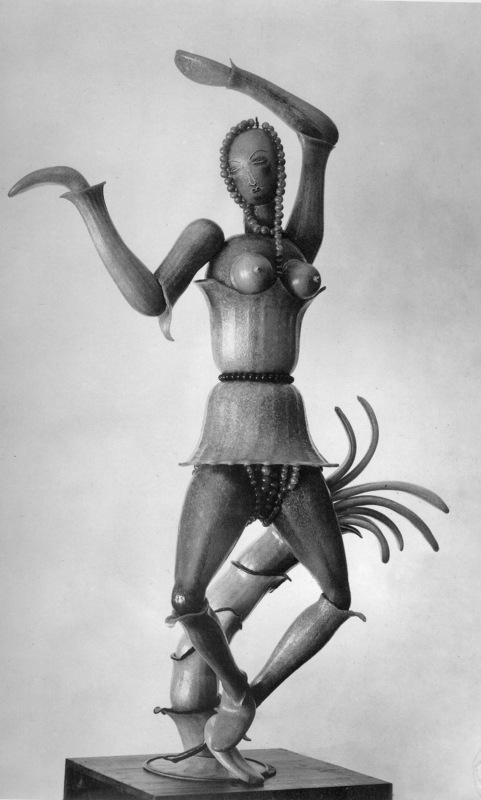 Pioneers of modernism like Picasso and Brancusi took inspiration from the pure forms and direct expression of so-called primitive and folk art. Among them was the Polish-born, Paris-trained sculptor Elie Nadelman, who settled in New York in the 1910s after marrying an American heiress, Viola Flannery. Together they assembled an important collection of folk art and built a private museum to house it. Without the example of the Nadelmans it’s unlikely this striking, almost surreal-looking milliner’s stand would have found its way into the collection of Mr. and Mrs. A. Stewart Walker, a Social Register couple with worldly tastes. Mr. Walker was a prominent architect who commissioned Nadelman to sculpt the monumental bas-relief that still presides over the 57th Street entrance of the Fuller Building, the celebrated Art Deco skyscraper he designed. 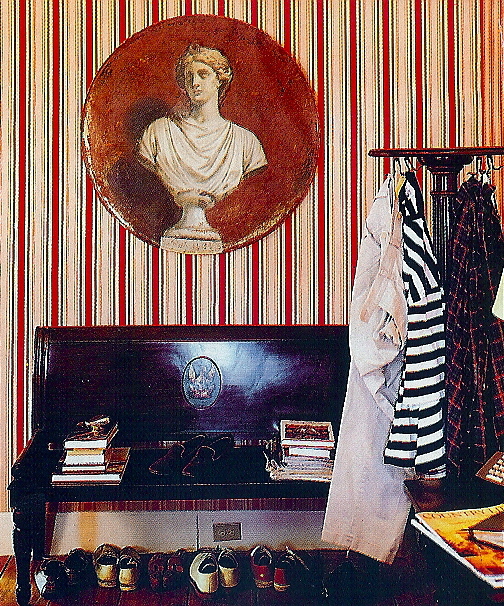 His wife Sybil was a celebrated decorator who arranged their Nadelman sculptures along with the old master paintings, 18th-century English furniture, and Jean Dunand lacquered objects in their Manhattan and Southampton residences. Folk art wasn’t really their thing, but the Walkers couldn’t have failed to appreciate the striking resemblance of this milliner’s head (a type they and the Nadelmans called a wig stand) to their friend’s own sculptures. And that begs the question, how did they come to acquire it? 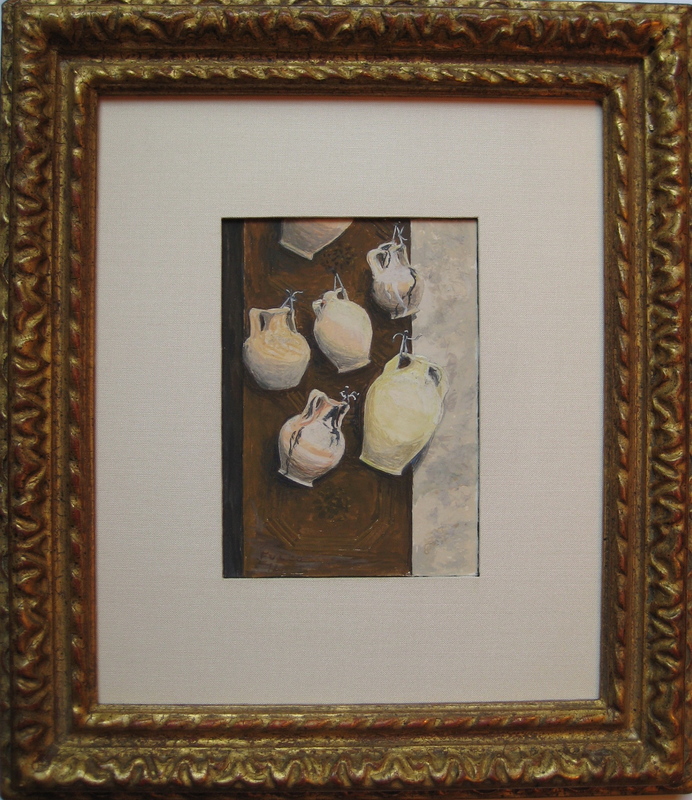 They could have bought it on their own, inspired by the Nadelman’s collection, but it is known that they exchanged gifts with the Nadelmans over the years. Or they could have acquired it when the Nadelmans were forced to sell off the collection during the Depression. Happily, most of it was purchased by The New-York Historical Society in 1937, thanks in part to the good graces of Stuart Walker, who had designed the museum’s expansion that very year. And there, in 2015, in the Walker-designed galleries, selections of the Nadelman folk art collection were juxtaposed with his modern sculptures in the exhibition The Folk Art Collection of Elie Nadelman: Making it Modern. Our sculpture warrented mention in the catalog. In the depths of the Great Depression, David Adler, the celebrated Chicago architect, went on a shopping spree for antiques in New York and London. His clients, Dr. & Mrs. Egil Boeckmann of St. Paul, were sitting pretty thanks to Rachel Boeckmann’s vast inheritance from her father, the railroad tycoon James J. Hill. Their refined red brick mansion, located just a few doors down from her parents granite pile on Summit Avenue, was designed by Adler, and furnished by him too, with an embarrassment of fine English antiques. 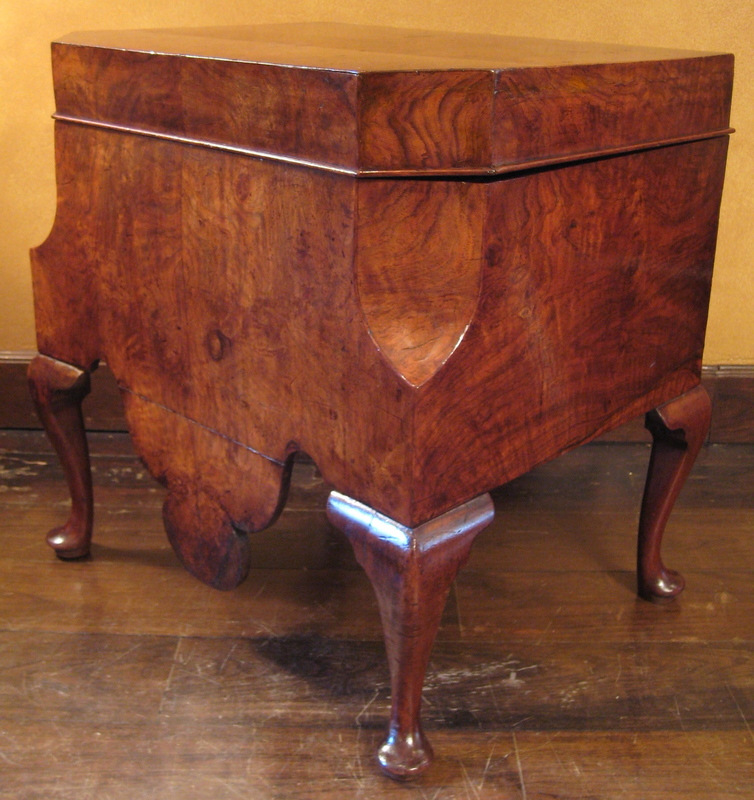 Among the better pieces Adler bought for his clients was this handsome, walnut-veneered wine cellaret that came to us with its original 1930 bill of sale from Lenygon & Morant, the eminent London antiques dealership with a branch on New York’s Madison Avenue. Since twentieth-century wine bottles are taller than their eighteenth-century ancestors, the Boeckmann’s staff would have had to position them horizontally, rather than vertically, to make them fit inside. That, and Prohibition, which wasn’t revoked until 1933, makes us wonder if this handsome, sculptural piece might have been used in the library as an end table, rather than the dining room as a cellaret for contraband wine. Shortly after the invention of the light bulb, decorative urns, vases, and other kinds of vessels were wired for electricity. This adaptation of the antique for modern use had the benefit of casting the indirect light that flatters both rooms and the people in them. And when those vessels were carved from fine, translucent marbles and alabaster, they emitted a lovely, mysterious glow. 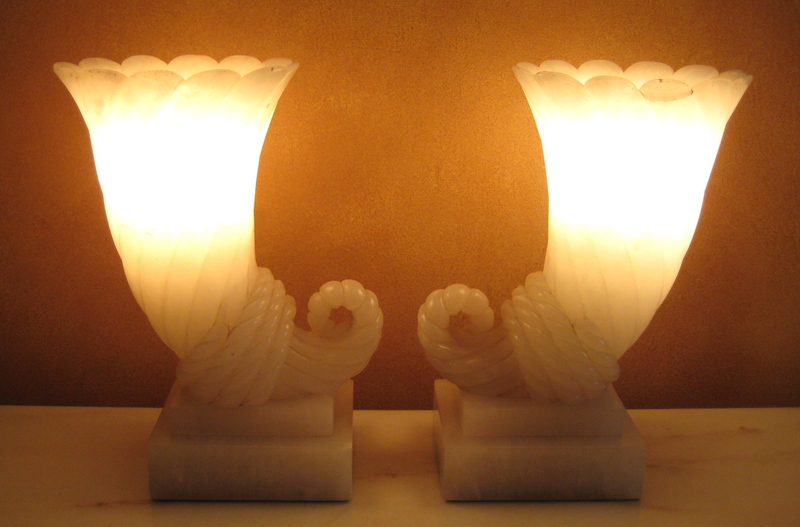 That’s why the Art Deco masters Louis Süe and Andre Mare set about designing from scratch stone lighting fixtures, which then came to be very much in vogue. 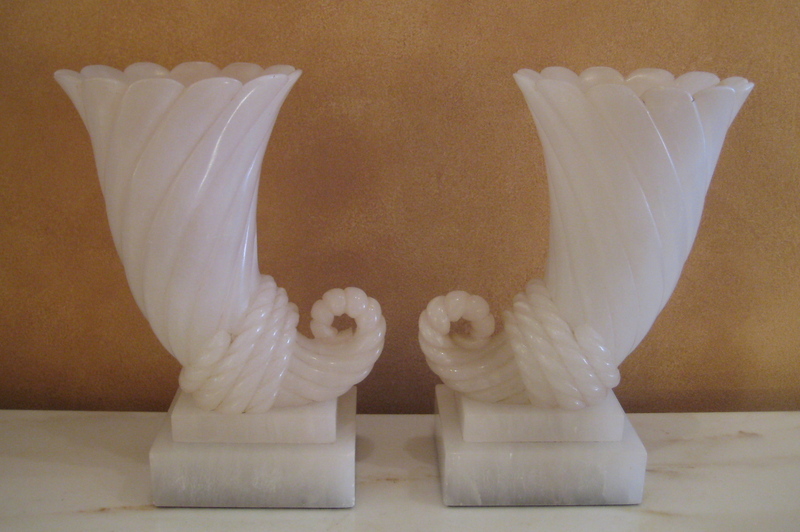 Our graceful pair of Italian alabaster lamps, which take the form of cornucopias fastened to bases with ropes, were carved in the Volterra workshops by a firm that was very much admired by Gio Ponti. 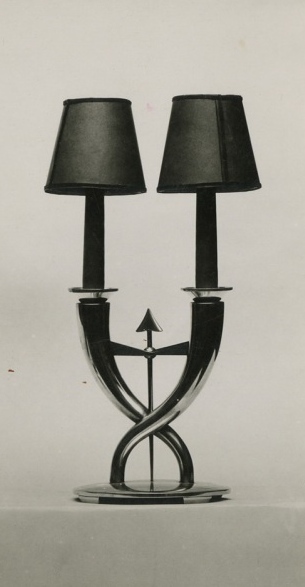 This great 20th-century architect [see below] founded the design magazine Domus that published this lamp model in the July 1938 issue. And no wonder, for they’re more illuminated sculptures than mere lighting fixtures. By the end of the 19th century the Victorian style was out and historical revivalism was in, but the makers of lighting fixtures didn’t seem to notice. 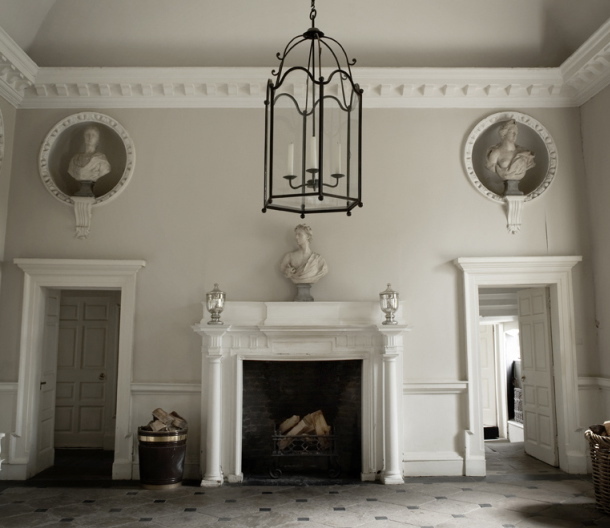 That made it difficult for architects and decorators to find the sconces, chandeliers, and lamps appropriate to the Renaissance, Georgian, and Colonial revival interiors they were furnishing. But in 1895 the portrait painter Edward F. Caldwell, egged on by his architect friend Stanford White of McKim Mead & White, put down his paintbrush and went into the lighting trade. 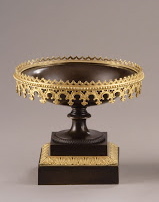 While Caldwell’s handsome fixtures filled the historicist bill, his reproductions of period models weren’t exactly exciting from a design point of view. But when Caldwell died in 1914 his behind-the-scenes partner Victor von Lossberg took over and put a modern spin on the company’s output. 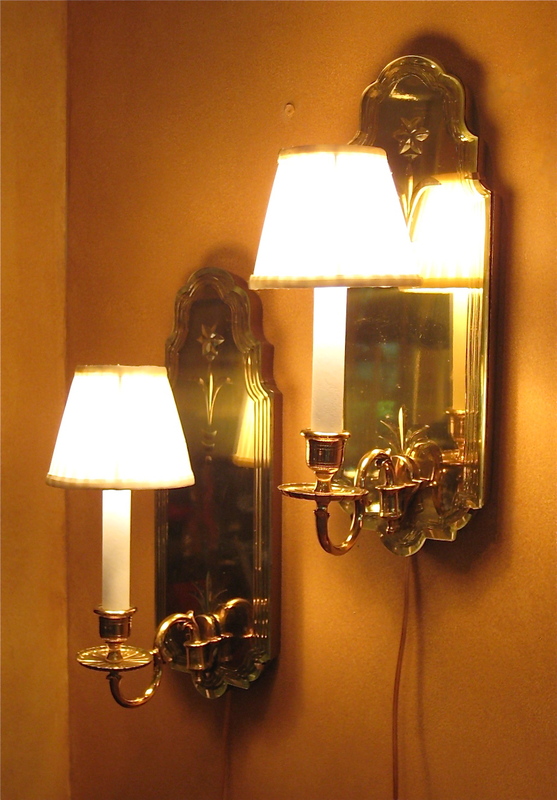 This glamorous pair of 1920s sconces, for example, may be 18th-century-English in form, but their golden glisten makes them more jazz baby than Queen Anne. For centuries glassmakers working on the island of Murano in the Venetian lagoon inspired their counterparts throughout Europe and beyond. Among them, it would seem, was the Englishman who, around 1800, created the bold spiral stem of this candlestick by fusing flattened blue and white glass canes back to back, and then twisted them in a column of clear molten glass. This stunning candlestick was owned by Baron Eugene Fould-Springer, the heir to a small French fortune who married the heiress to a big Austrian one. 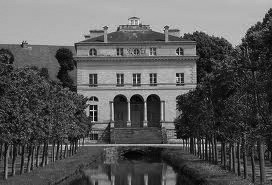 With the two conjoined he was in a position to indulge his pitch-perfect taste, and acquire Royaumont, a small 18th-century palace just outside Paris. 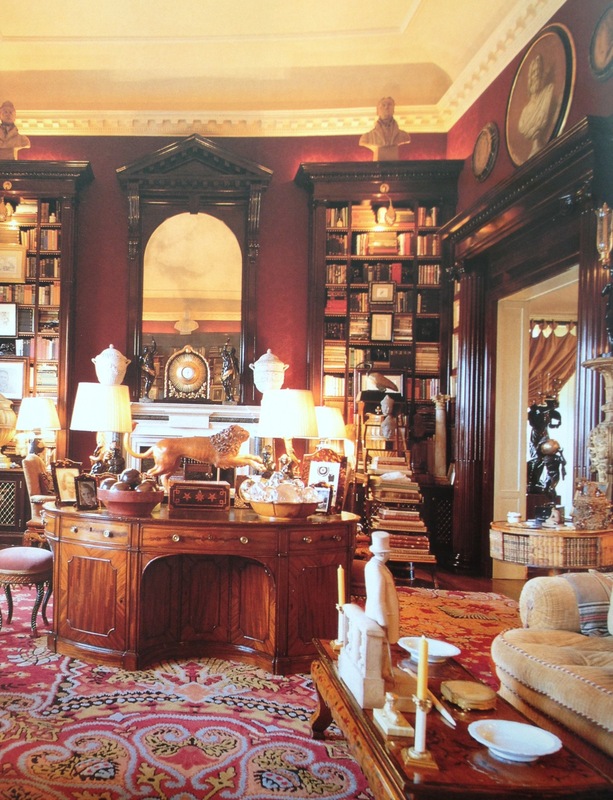 After restoring its ancien regime splendor, he went on to furnish it superbly. 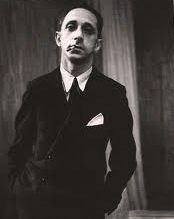 In the 1970s his handsome son Max (seen below) inherited the house and contents, which he in turn left to the arbiter of Paris society, his sister Liliane, Baroness de Rothschild. Design history was made in 1933 when Arthur Houghton Jr., scion of the family that owned Corning Glass, was put in charge of their underperforming division Steuben Glass. In short order the firm’s elderly founder and artistic director was shown the door, and his saccharine-colored, Victorian-looking wares were discontinued. 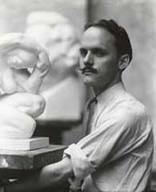 In came the young mustachioed sculptor Sidney Waugh who merged a stripped-down classicism with no-nonsense modernism. Around this time Corning developed a colorless glass known as G10M for commercial optical purposes, but its translucent beauty prompted Houghton to turn over the formula to Steuben for the production of luxury goods. This small urn is made from that new glass, although it takes its form from the large terracotta kraters of ancient Greece that were used for mixing wine with water. 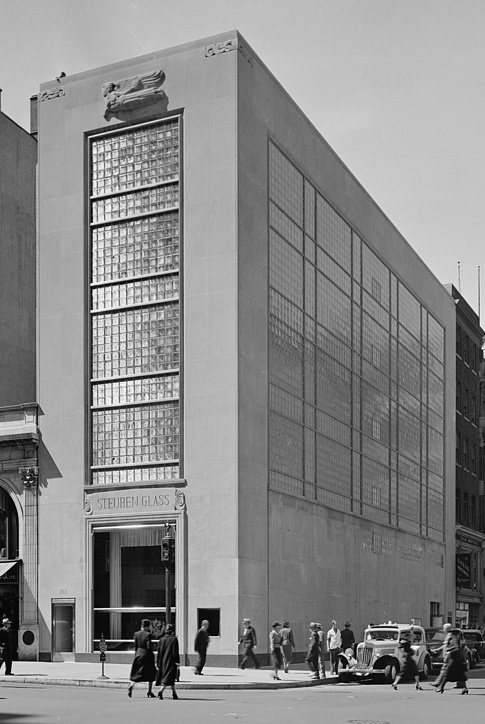 Waugh’s interpretation of classic designs, the ravishing glass, and the sleek Fifth Avenue showroom built to showcase them, would usher in Steuben’s golden age. In the 18th century demand for Asian luxury goods in the West so exceeded the supply that craftsmen set about making things chinoiserie. Back then the scarcity of lacquered imports and the inability to produce true lacquer prompted imitations in glossy paints and varnishes. History repeated itself two hundred years later when the flow of luxury goods from China came to a dead stop, thanks to Chairman Mao’s Cultural Revolution that demonized craftsmen as mini capitalists. Meanwhile, on the other side of the world in Paris, a team of Chinese artisans lacquered away in a building done up au chinois for the art dealer C. T. Loo. In addition to offering Western museums ancient Chinese treasures, he supplied a more style-conscious and less scholarly clientele with smart furnishings in true lacquer. 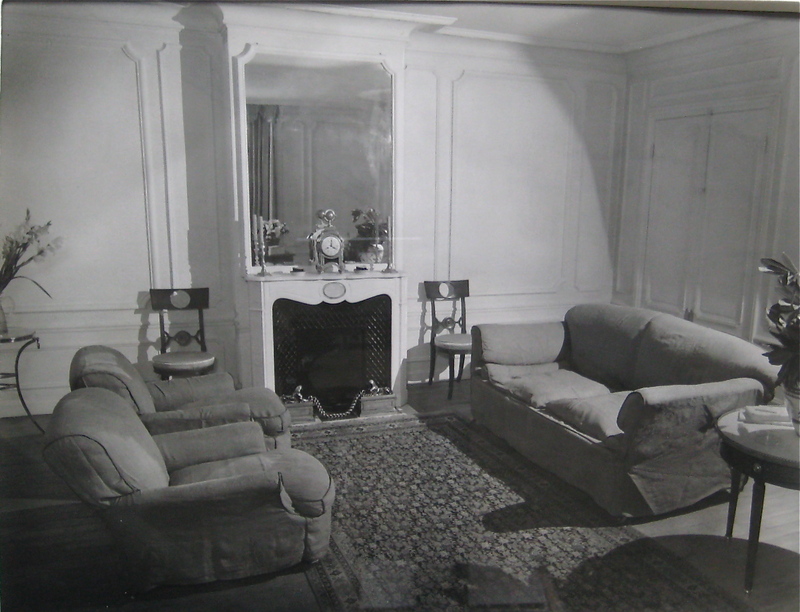 Among them were the politically incorrect cigarette and telephone tables that decorators like Henri Samuel and Michael Taylor placed within reaching distance of low-slung banquettes in faux-lacquered rooms.